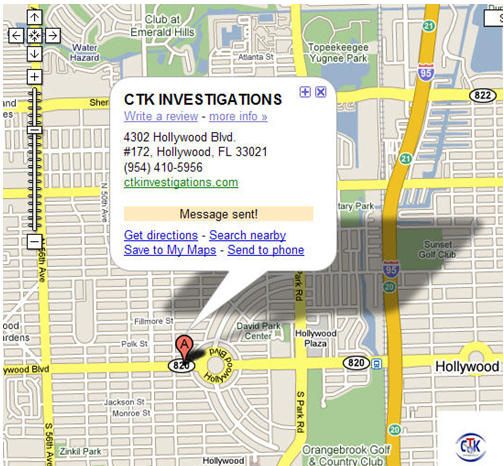 CTK INVESTIGATIONS, LLC is a Florida private investigation agency located in Hollywood, Florida that provides a broad spectrum of client services. Our Florida private investigators are called upon daily for surveillance, computer forensics, security camera instillations, pre-employment screening, skip traces, cheating spouse surveillance, workers’ compensation fraud surveillance, south Florida personal injury and south Florida workers’ compensation injury accident cases. Our Florida private investigators provide services for Florida car accident lawyers, motorcycle accident lawyers, all personal injury cases in Florida and Florida workers' compensation attorney’s offices. We assist other Florida litigation attorneys with asset searches, background checks and surveillance. The Florida private investigators in our office provide a complete range of services for attorney’s offices such as client sign-ups, accident investigations, satellite imagery, workers’ compensation claims investigationand surveillance just to name a few. CTK INVESTIGATIONS, LLC. – We are Florida Private Investigators that provide many affordable investigative services customized for you such as: background checks, surveillance, and asset searches. We handle both plaintiff and defendant’s work as, (Res ipsa loquitur ) the facts speak for themselves. While our main office is in Hollywood, Florida, our South Florida private investigators can, and will cover nearly the entire state. Feel free to call Cory Knight or any of our Florida Private investigators today for a FREE consultation at (954) 652-0733. After investigating thousands of cases, our clients have entrusted our licensed and insured Florida private investigators at CTK INVESTIGATIONS, LLC with their confidential investigative needs. The Florida private investigators in our agency will obtain the background information, asset searches, surveillance, or any other search you request in a timely manner. On a daily basis, our south Florida private investigators are called upon by South Florida personal injury attorneys that specialize in both plaintiff cases as well as insurance defense. We have many Florida surveillance experts that are willing to assist you with your Florida workers’ compensation investigation. Whether you are a workers’ compensation attorney or case manager / adjuster, Cory T. Knight, and our Florida private investigators will be more than happy to offer you a free consultation. Our surveillance and investigation specialist have years of experience and our reputation speaks for itself. We offer discrete, fast, cost effective and thorough services to offer Florida personal injury attorneys, Florida workers’ compensation attorneys, as well as individuals looking for assistance. Computer Forensics: Our Florida Private Investigators and south Florida computer forensics experts know how much evidence can be found on a computer. Our staff computer forensic experts apply their years of training and experience coupled with cutting edge computer forensic tools with old fashion private detective work to provide you with superior computer forensic investigations. Call one of our computer forensics experts today for a FREE consultation. Let our computer forensics experts help you today. Child Support Investigations: Our Florida private investigators field daily calls where one spouse or significant other has the need to investigate the other parent to provide a piece of mind, along with evidence for your custody case. The ever overcrowded court systems does not allow for case workers to complete onsite investigations. If you think that your significant other has your child in an unsafe environment, please feel free to Call our Florida private investigators today for a FREE consultation, and ask about our child support investigations. Other Investigations: These may include Asset Searches, Finding lost family members, Florida personal injury Attorney services such as client sign-ups, witness statements, pre-employment screening and many other investigations. We encourage you to contact Cory T. Knight or any of our Florida private investigators today to discuss how we can assist you. All calls are confidential. Please feel free to contact Cory T. Knight or one of our south Florida private investigators at (954) 652-0733 to discuss your investigative needs. If you prefer, you can contact CTK INVESTIGATIONS, LLC via e-mail by clicking here. What is a Florida Private Investigator? A Florida Private Investigator is a professional trained in the art of investigations and surveillance. In Florida, a license is mandatory. Like with an attorney or doctor, the State has mandated that certain qualifications, training and experience be required for licensure to protect the public from those who do not have the experience or qualifications to do the job correctly. Our Florida private investigator’s are highly trained in all aspects of investigations, and have met or exceed the requisite licensure. Our Florida private investigators hold your work strictly confidential and are always here to assist you with your investigative needs. What does a Private Investigator actually do? Our south Florida private investigators are here to assist you with your various investigative needs. Our Florida detectives can and will gather information for businesses and individuals, and provide you with the information you desire. The facts may not always be what you expect but we will provide you with unbiased information in an ethical manner. Our private investigators work on many different types of cases such as car accidents, motorcycle accidents, workers’ compensation investigations, and our agency assists Florida personal injury and workers’ compensation attorneys on a daily basis. It does not make a difference if you are a fortune 500 company, a south Florida personal injury attorney, workers’ compensation adjuster or an individual with a personal problem; we take each case with dedication and professionalism. Our Florida private investigators are trained to perform functions like cheating spouse surveillance, workers’ compensation fraud surveillance, and many other services for Florida personal injury attorneys and Florida workers’ compensation attorneys. Our detectives in our agency have access to computer databases and searches, that the public does not, which allow us to quickly obtain large amounts of information. Because of the nature of our work, we also can be called to testify in court. Our south Florida private investigators can confidentially get you the answers you need, in an efficient, accurate, affordable, and ethical manor. What makes CTK INVESTIGATIONS the best choice to be your private investigators? The bottom line is, We Get You Results! You may not like what we find, but results are results. Our south Florida private investigators are able to work for plaintiff and defense firms and insurance companies because the facts are the facts. We complete a fair and impartial investigation, and let the facts speak for themselves. We offer professional services in a timely and ethical manor at reasonable prices. Many other Florida private investigators are less expensive, however the old adage is true, “You get what you pay for.” While most private investigators are retired law enforcement officers working by themselves, out of their homes, CTK INVESTIGATIONS, LLC. is a diverse agency with well trained Florida private investigators who utilize the best tools in the industry to provide you with results. Our Florida private investigation agency will not take your case unless we are confident that we are suited to deliver precisely what is requested. Once we take your case we will conduct the investigation in a time efficient and professional manner, always keeping your satisfaction as our main goal. If you have a case in an area where we are not able to provide you with service, we would be more than happy to give you a FREE referral to a private investigator that we know who can assist you. We understand that many times hiring a private investigator may be uncomfortable. You have our assurance that no matter what your situation entails, we will listen to you and give you a detailed explanation of how we can help. As always, a consultation with one of our Florida private investigators is FREE and strictly confidential. Call Cory T. Knight today at (954) 652-0733 or click here to e-mail us today. You get what you pay for. If you have any questions, feel free to click here contact Cory T. Knight at CTK INVESTIGATIONS, LLC, or you can call our agency at (954) 652-0733 to speak to any of our private investigators. At CTK INVESTIGATIONS, LLC, all of our private investigators are licensed and insured within the state of Florida. We are your South Florida Private Investigators. Our Florida Private Investigators and south Florida computer forensics experts know how much evidence can be found on a computer. Our staff computer forensic experts apply their years of training and experience coupled with cutting edge computer forensic tools with old fashion private detective work to provide you with superior computer forensic investigations. Call one of our computer forensics experts today for a FREE consultation. Let our computer forensics experts help you today. contact us today.Spousal Surveillance: The Florida private investigators at CTK INVESTIGATIONS, LLC have years of cheating spouse surveillance experience. Our Florida cheating spouse investigators understand the fear of infidelity, when it overcomes your life, you need answers. We clearly realize that contacting a Florida private investigator to check on your loved one or spouse is hard to do, but living with doubt and fear can be worse. Not only will our cheating spouse surveillance experts get you the proof that you need to move forward with your life, they will do so in a discreet and tasteful way to minimize your anxiety. Contact Cory T. Knight today to discuss your spousal surveillance needs. Background Check: If you are a small business owner, or a CEO of a fortune 500 company, our Florida private investigators can assist you with your hiring decisions. Our investigators can provide you with a background check on your potential employee, nanny, roommate, boyfriend, or to simply check someone you met online…make an informed decision prior to your final decision. We have completed many online dating checks for people that met on MySpace, FaceBook, J-Date, and many other online chat and dating services. Our licensed and experienced Florida Private investigators can and will protect your interest. Call our Florida private investigators today for a FREE consultation, and ask about our background checks.